EBC brake rotors now features reduced three-slot venting which provides slightly less air noise under heavy braking while still maintaining the benefits of cooler running with the full width slot design. Wide slots help brakes run up to 200 degrees cooler. The latest in sport brake rotors features wide aperture slots that draw cool air into the braking contact area and reduce temperatures preventing brake fade. Dimple drilling avoids stress cracks and the new gold anodized EBC finish provides great looks while preventing corrosion. EBC 3GD Series Dimpled and Slotted Sport Rotors are designed to maintain flat and parallel brake pad wear and avoid the record grooves or galling common with non-slotted rotors. The EBC 3GD Series is an excellent sport rotor for your car's brakes. The EBC 3GD Series of Dimpled and Slotted Sport Rotors Reduces brake fade under load and at speed. Rotors are designed to remove dirt, dust and debris from your vehicle's braking zone. The ideal rotor for Trucks, SUVs and towing vehicles, these versatile brake rotors are also a terrific option for sport sedan use. 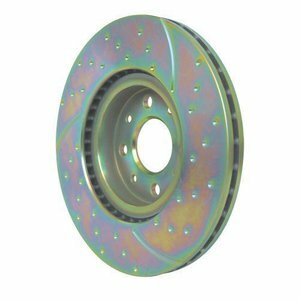 Brake rotors are anodized for protection Gold for imports or Black for domestics.